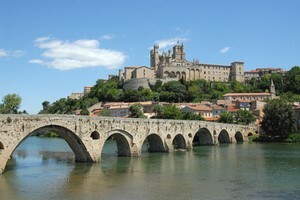 Compare prices on car hire in Béziers from all the major brands and find the best deals. When you book through us, unlimited mileage and insurance are always included in the price given. Béziers is located in southern France , 14 kilometers from the Mediterranean Sea.The city is located west of Nimes , on the River Orb and the Canal du Midi in Languedoc-Roussillon.Stay around. 82,000 inhabitants. Béziers is the center for trade in wine and spirits. City Centre is dominated by the Cathedral Saint-Nazaire from 1200-1300’s. Here is one of the best views of the city. In Béziers are also ruins of a Roman theater. Béziers was destroyed and the inhabitants massacred during the crusade against albigenserne 1209 In the middle of August the town hosts the famous Feria de Béziers, a fire fencing event.More than a million visitors participating in the four-five-day festival. Then the music and celebration in the streets. The city’s art museum, the Musée des Beaux Arts, includes paintings by Rubens and Delacroix, and local artists. Just beyond lies the picturesque village of Roque Brown featuring cliffs and Wine Tasting. The airport is Beziers Cap d’Agde is located 11 kilometers outside the center.